With bicolor HEWI offers the option of individual design. Unique fitting solutions become a statement of personal style. Made of two materials, bicolor offers an unusual mix: Polyamide meets stainless steel. 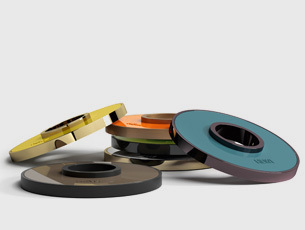 Roses made of stainless steel and with metallic finishes in PVD enclose a coloured inlay made of polyamide. 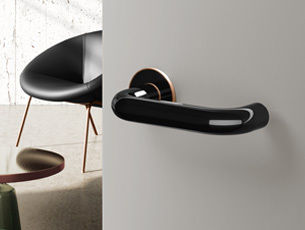 Stainless steel and PVD nuances in brass, copper, bronze or black chrome, mirror polished or with satin finish, depending on the lever handle design it is possible to combine with up to 16 polyamide colours. The fitting thus becomes a decorative item on the door and sets completely new accents. Flat roses not only enable a reduced design, but also fast and easy installation without visible fixings. Apart from the private premium segment, the option of individualisation is not only interesting for exclusive housing, but also offers companies in office and commercial buildings the option of implementing their corporate design down to the smallest detail. bicolor is available for Systems 111 and 162 from April 2017. 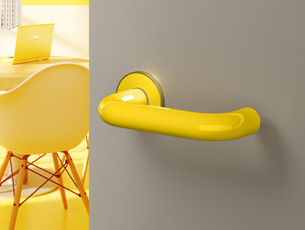 HEWI invites you to a creative play with colour and material: With the help of a configurator the lever door fittings can be created completely according to personal preferences – whether as a single item or as a continuous design object, which lends the building its own character. Depending on the lever handle design, up to 2500 combinations of the individual components are possible.